The Heritage: Black Athletes, A Divided America, and the Politics of Patriotism. By Howard Bryant. Beacon Press, 238 pages, 2018. Once upon a time, black athletes were acutely aware of the “Heritage.” That is, they recognized that sports were inseparable from the quest for racial equality and social justice. ESPN analyst Howard Bryant sees Paul Robeson as the “original conscience and soul” of the Heritage, and Jackie Robinson as “its godfather” (39). Bryant capitalizes Heritage throughout his book to call attention to how black athletes after Robinson saw themselves as his (metaphorical) sons and daughters. Earlier figures such as Jesse Owens and Joe Louis brought pride to the black community, but they were also co-opted. Owens exploded the myth of Aryan superiority with his feet and Louis with his fists, but both were used as symbols of the “Good American” (33) in the war against fascism, even though American society was nearly as racially closed as Hitler’s Germany. Activism was a key component of the Heritage—as was the price that came with it. Robinson died at just 53, but he looked decades older. Nonetheless, by the 1960s numerous black sports heroes embraced the Heritage and paid the tab: Bill Russell, Muhammad Ali, Kareem Abdul-Jabbar, Jim Brown, Curt Flood, Bob Gibson, John Carlos, Tommie Smith…. Some did well despite their activism, but others (Flood, Carlos, Smith) did not. Each left a lot of money on the table because they refused to ignore racism and felt it their duty to uphold the Heritage. So how did we get to the point where quarterback Colin Kaepernick can’t get a job in the National Football League because he knelt during the National Anthem? How did he become the household name, not those for whom he kneeled—Michael Brown, Eric Garner, Freddie Gray, Trayvon Martin, and others? Why does the NFL uphold racist owners such as Jerry Jones who threaten to make another Kaepernick of future kneelers? Bryant bluntly asserts that it’s because black bodies only matter on the playing field. He doesn’t stop there. In passages certain to ruffle feathers, Bryant also blames money and the militarization of American society. Some of his villains will surprise: O.J. Simpson, Michael Jordan, and Tiger Woods. Although Bryant understands the allure of big money, he sees those three as having undermined the Heritage. Whereas Owens and Louis were (literal) posters for the Good American, Simpson, Jordan, and Woods became corporate shills. Bryant doesn’t invoke this example, but readers may recall Spike Lee’s Do the Right Thing (1989) and a scene in which Pino (John Turturro), an Italian American, launches N-bombs in front of his erstwhile black friend Mookie (Lee). An incredulous Mookie asks him how he can do that when his favorite player, Michael Jordan, is black. Pino responds that he doesn’t see Jordan as a [expletive]. Exactly! That’s the problem, as Bryant sees it. Jordan was part of a generation of black athletes who made millions by not being black. The Good American gave way to a green-washed myth of a post-racial society. Woods went so far as to call himself a multiethnic “Cablinasian” (39-41). Bryant understands how hard it is for young black athletes to turn away from the millions of dollars that can come their way by setting aside politics. He’s crystal clear, though, that it entails repudiating the Heritage. He isn’t letting anyone off the hook. It would be comforting for whites to construct a narrative in which black people sell out their own. Whites have been doing that for years to dodge responsibility for black poverty, drug-infested neighborhoods, and urban gangs. The Heritage isn’t just another sports book. Bryant is a keen observer of American history and sociology. What happened to the Heritage is only partly explained by greenbacks. There is also the broader context of what has happened to protest across American society. It has been on the wane since Ronald Reagan’s beat-down of labor unions and feminism. What began in the 1980s went into hyper drive after 9/11. Look at what befell the Dixie Chicks in 2003, when singer Natalie Maines expressed displeasure with George W. Bush. Dissent within a nation founded by revolutionaries has become, paradoxically, un-American. Bryant details the “collision” (ix) that occurred between sports and the military—one that wrestles over the question of “who’s the patriot” (203)? You are naïve if you think all the military pageantry you see in sports venues is heartfelt and spontaneous. It’s as orchestrated and fake as a World Wrestling Federation match. Every time you see a flyover, a vet singing “God Bless America,” or witness a tearful reunion between veterans and their families, the U.S. Armed Forces paid for these to be staged. You read that correctly; owners of pro sports teams cash Department of Defense checks funded by citizens tax dollars for scripted melodrama. The military uses these events as recruiting tools for an all-volunteer military that’s having trouble filling its ranks. Jerry Jones’ outrage isn’t that of the wounded patriot; it’s the complaint of a man whose cash cow is on the slaughter line. 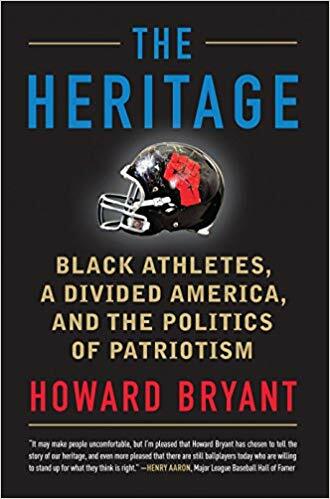 Howard Bryant’s book is the sports version of what Noam Chomsky and Edward S. Herman called “manufacturing consent.” His remarks will anger sunshine patriots, but their outrage would be better directed at the hokum, not kneeling players. Fans had better get used to protest. Not all sports embrace NFL-style authoritarianism. The National Basketball League has begun to accommodate black activism—as should a sport in which 75 percent of the players are black. LeBron James is among those seeking to reclaim the Heritage. Many observers feel that the big stage of Los Angeles motivated him to sign with the Lakers, a burning desire to transform them into a championship caliber team. Apparently even President Trump is worried about Citizen LeBron, as evidenced by his unprovoked attack on James in August. Of the Heritage, Bryant writes, “It is a responsibility the black player will carry until America values the black brain over the black body, and the black people, like all others, rise through education and not touchdowns. Then sports for black people can finally be reduced to what it should have always been in the first place—just a game” (238). *Jackie Robinson was not the first black player in the Major Leagues. The American Association, then a professional league on par with the National League, had black players until 1887. It was pressured to ban them by the National League, a prohibition that stretched from 1888 through 1946. ← 5 Days to NEPCA!